Propel's "105 Octane Tour" is offering Flex Fuel E85 for $1.05 per gallon to drive awareness of the fuel's high octane rating which provides increased power and acceleration, while reducing emissions and air pollution. 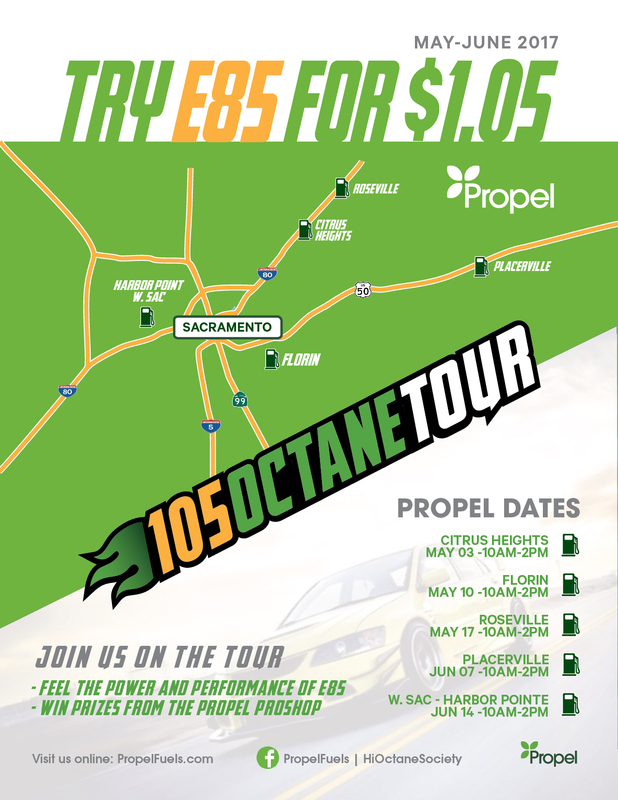 SACRAMENTO, CA--(Marketwired - May 01, 2017) - Propel Fuels is launching the "105 Octane Tour" this week in California, offering Flex Fuel E85 for $1.05 per gallon at several retail locations to drive awareness of the fuel's high octane rating which provides increased power and acceleration, while reducing emissions and air pollution. E85 is a clean-burning alternative to petroleum gasoline that is performance-optimized for use in Flex Fuel vehicles. E85′s octane rating is considerably higher than premium gasoline (105 vs. 91 octane) and is comparable to racing fuel, increasing vehicle horsepower and acceleration, especially in higher compression engines. "The benefits of using E85 such as increasing power, reducing emissions, along with the lower fuel prices made the switch inevitable," said Propel customer Tony "Speedmaster" Lee. "The overall increase in horsepower and torque was like night and day between 91 (gasoline) and E85. The E85 made it so that the tuner could squeeze more power, raise the boost, and operate at a lower engine temp." "E85 is truly connecting with today's smart, savvy drivers who want more value from their fuel than gasoline is giving them," said Rob Elam, CEO of Propel. "Millennials are our fastest growth segment, as more drivers of high performance cars are seeking a powerful fuel to meet their needs." Brand powered and data driven, Propel utilizes the most effective modern retail techniques to engage consumers with a compelling alternative to fossil fuels. With customer loyalty exceeding even Starbucks Coffee, Propel's retail brand significantly outperforms major oil brands including Chevron and Shell, and has earned the company a 70% share of the E85 market in California, one of the largest and most dynamic consumer fuel markets in the world. Propel's retail customers are valued over 10X lifetime value compared to fossil fuel customers of major branded retail. Propel's research and development lab, The Silicon Valley Workshop, has released important white papers detailing E85 consumer behavioral data. Including the 2016 consumer study revealing new data about mass-market low carbon fuel adoption in California. Propel's Low Carbon Fuels in California: Motivators and Barriers to Use illustrates the compelling demographics of the E85 consumer base. Propel was founded in 2004 with a mission to connect people to better fuels. With 34 Flex Fuel and 32 Diesel HPR locations across California, Propel provides new fuel choices that are higher in performance, deliver better value and create healthier communities. Propel ranked among 2015's top 10 private companies in Silicon Valley and is recognized by Inc. Magazine's "Inc. 500". Propel was named winner of the 2016 Clean Energy Awards for Best Clean Energy Technology Innovator by Global Energy News, and was a finalist for the prestigious 2016 Platts Global Energy Awards for Industry Leadership. More information is available at propelfuels.com and by following Propel at facebook.com/propelfuels and on Twitter at @PropelFuels. Video testimonials from Propel customers are included in a video "A day at Propel". More information, screenshots, B-Roll video and photography for download and use is available at: propelfuels.com/media_kit.